Christmas is so close! Do you have your menu figured out yet? 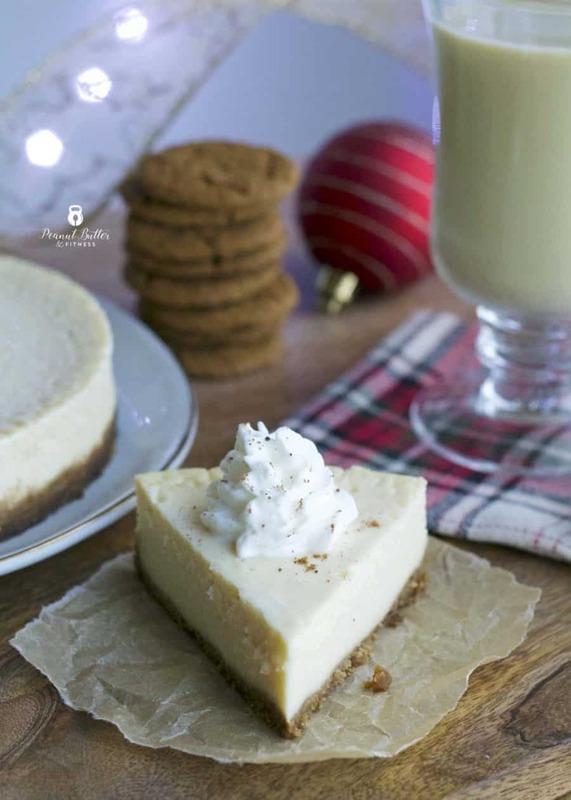 I’ve been on a bit of an eggnog kick lately (another eggnog recipe is coming later this week too ;)) and this cheesecake is perfect. It’s nice and creamy with that classic eggnog flavor. 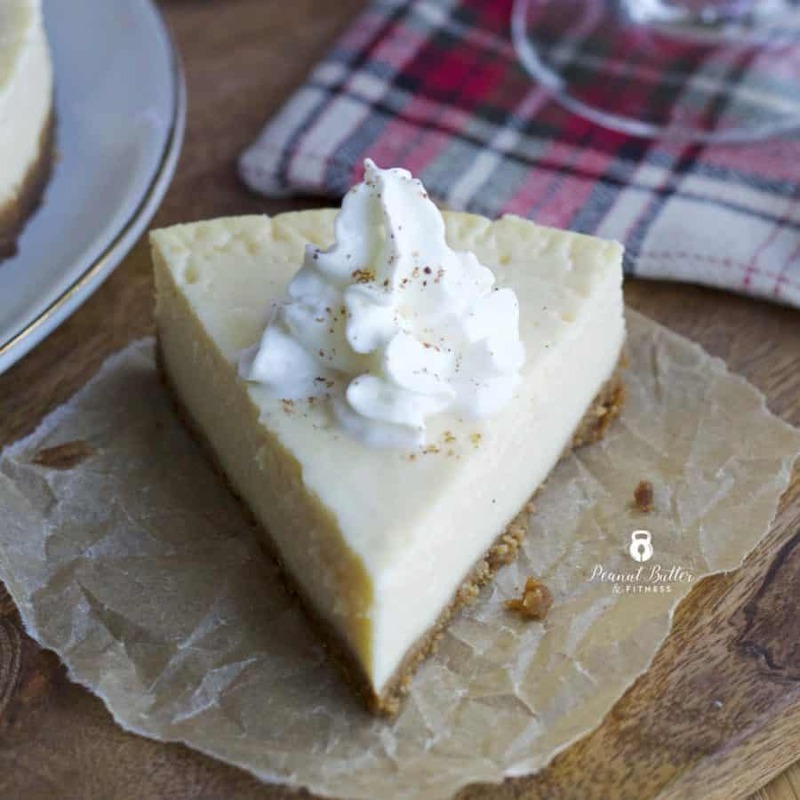 The gingersnap crust adds the perfect sweet/spicy bite to it. 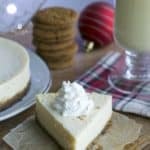 I tried to make this recipe into little cheesecake bites in a sheet pan and it just didn’t work out as well. I think part of the problem was because I couldn’t fit the pan into a water bath for one, plus I ran out of real egg whites and had to use the ones from a carton. It was still tasty, but the texture was a bit off. 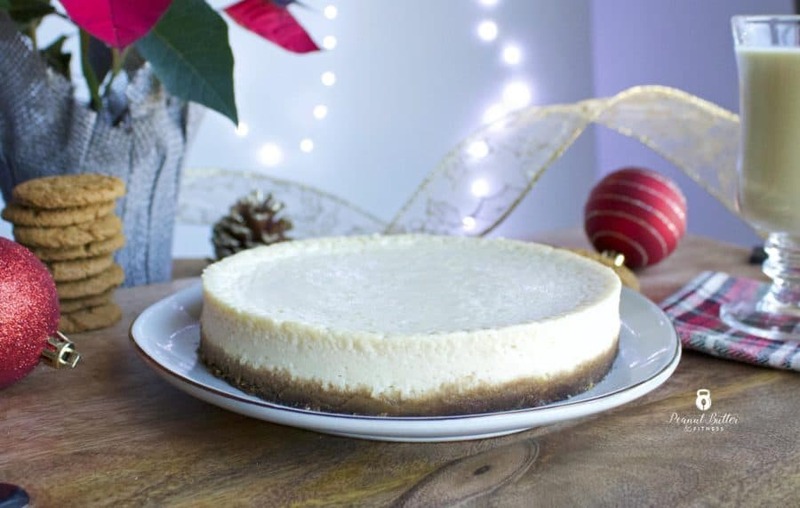 I recommend sticking with the real cheesecake form for best results, aka that classic, creamy cheesecake texture! The key to a pretty looking cheesecake that’s nice and smooth on top is baking it in a water bath. Now, the little springform pan that I use says that it’s supposed to be leakproof, but I don’t think they meant leakproof in a water bath. So I wrap it up in a slow cooker liner to keep the water out. I just set the whole thing into a bigger pan and pour water in the big pan until it’s close to the top of the cheesecake batter. I also let the cheesecake cool in the water bath for about 30 minutes (covered with a thin dish towel) after I take it out of the oven before transferring it to a cooling rack. I topped mine off with a bit of fat free whipped cream and a pinch of nutmeg before serving. The cheesecake is perfectly delicious without it…as evidenced by the fact that I’ve been eating slivers of it with my hands for a week. No plates or forks for me, folks! 😉 Scan this barcode to log a slice into My Fitness Pal! Pre-heat oven to 325 degrees. Line the bottom of a 7" springform pan with parchment paper and grease the sides about halfway up with coconut oil. 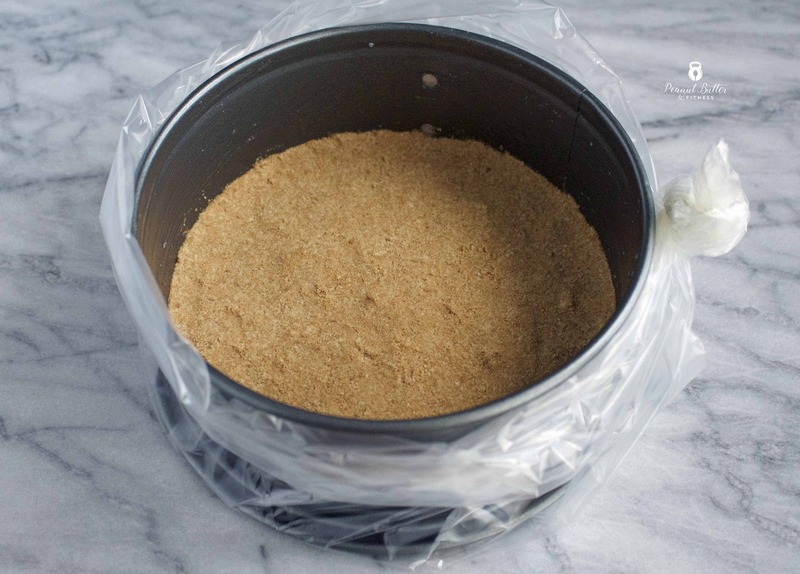 Place pan inside a slow cooker liner or baking bag (see photos). Mill or crush ginger snap cookies and mix will almond flour. Pour into bottom of springform pan and press down firmly until it forms an even crust. In a Nutribullet or blender, blend cottage cheese and eggnog until smooth. Add remaining ingredients and continue to blend until smooth. Tap the bottom of the blender cup gently against the counter to help work out air bubbles. Pour cheesecake mixture on top of crust in springform pan. Again gently tap the bottom of the springform pan against the counter to help work out air bubbles. Use a toothpick to help pop air bubbles that surface if needed. 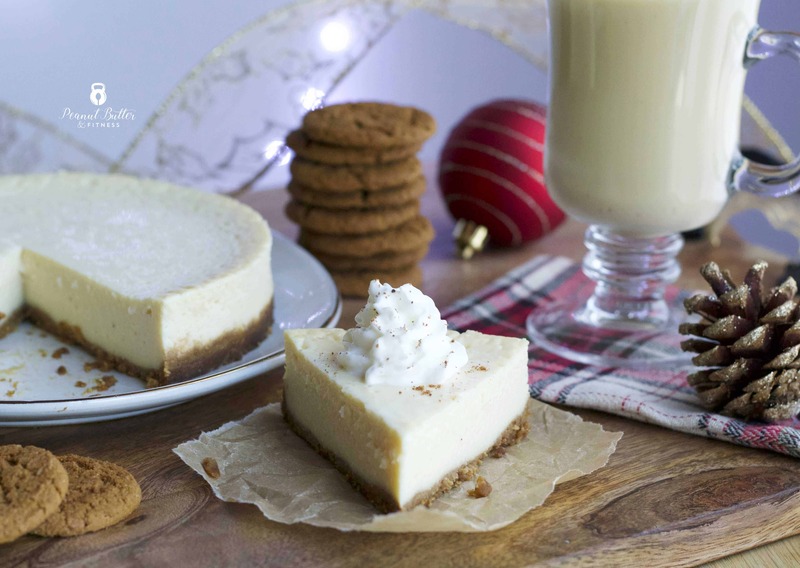 Place pan wrapped in slow cooker liner into a larger dish and create a water bath for the cheesecake to cook in. Do not allow the water level to rise past the top of the cheesecake. Bake at 325 degrees for 1 hour to 1 hour and 10 minutes. Once the top of the cheesecake jiggles only slightly, remove from the oven and allow cheesecake to cool slightly in water bath before removing springform pan to a wire rack. 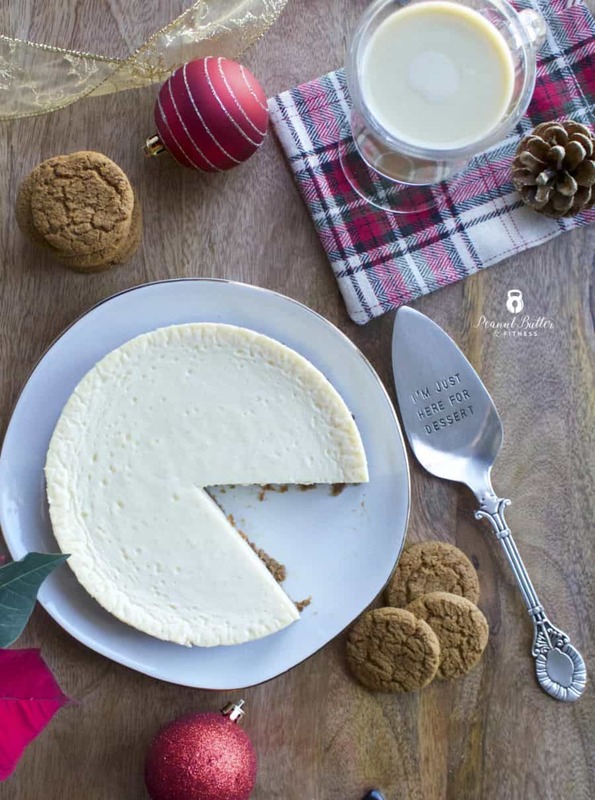 Once the cheesecake is mostly cooled, remove the cheesecake from the springform pan and place on a serving dish. Refrigerate overnight, loosely covered, to set up.